Forget LeBron James, the real king is here! The first poster for 2018's Black Panther film directed Ryan Coogler has been released by Marvel Studios and the first teaser trailer debuted during Friday night's NBA finals game as well. UPDATED: The much-anticipated first teaser trailer for Marvel's 'Black Panther' did not disappoint last night as it was released during the NBA finals broadcast (it was probably a welcomed distraction for fans of the Golden State Warriors who were being pounded by a very desperate Cleveland Cavaliers team). In nearly two minutes of video, Marvel Studios was able to jam some amazing images and quick peeks at the star-studded cast beginning with Chadwick Boseman as the king of the fictional African nation of Wakanda, T'Challa and as the hero the Black Panther. Marvel made the perfect call to hire director Ryan Coogler after stunning audiences and critics with Fruitvale Station and Creed. Once again, Coogler is writing and directing as Marvel had the good sense to get out of the way of the young talented and passionate filmmaker. Coogler brought on Ruth E. Carter as the film's costume designer, Rachel Morrison as the director of photography, and Hannah Beachler as the production designer to give 'Black Panther' the beautifully designed world you see in the trailer. Wakanda is one of the most technologically advanced nations in the world but also maintains a rich African culture that is evident in the costumes and makeup. As for the cast, the trailer opens with an interrogation scene between Ulysses Klaw (Andy Serkis) and Everett K. Ross (Martin Freeman). W’Kabi (Daniel Kaluuya) escorts the film's villain Erik Killmonger (Michael B. Jordan) to the royal chamber. Nakia (Lupita Nyong'o), Okoye (Danai Gurira), Ayo (Florence Kasumba), and the Dora Dora Milaje (Black Panther’s personal female bodyguards) all look like the fierce warriors out of the comic books. Forest Whitaker is seen briefly, a white-haired Angela Bassett as the queen mother Romonda makes us long for a decent Storm movie, and Leticia Wright as T'Challa's sister Shuri looks every bit the badass as her brother. The teaser does what it's supposed to do, make you want to see more - now! Unfortunately, we'll have to wait eight more months for its release. Stay tuned for the inevitable release of more photos, trailers, and set pics as we get closer to release day. The king has most certainly arrived. Introduced in Captain America: Civil War, Chadwick Boseman plays the king of Wakanda, T'Challa, and doubles as the proud African nation's hero, the Black Panther. T'Challa returns home but finds his sovereignty challenged by a long-time adversary in a conflict that has global consequences. As for the poster, it is rather subtle and plain compared to the hodge-podge photoshop-palooza of 'Spider-Man: Homecoming. 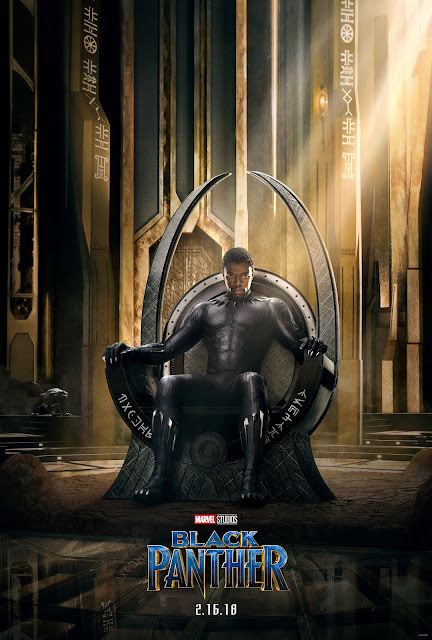 'In it, T'Challa sits on his throne without his Black Panther mask. The room itself is regal and futuristic reminiscent of Asgard. T'Challa is the focal point as he should be without a bunch of random floating heads mucking up the poster. Boseman leads an all-star cast that includes Michael B. Jordan, Lupita Nyong'o, Danai Gurira, Daniel Kaluuya, Angela Bassett, and Forest Whitaker. Martin Freeman and Andy Serkis also star. 'Black Panther' hits theaters on Feb. 16, 2018.